The instruments of DeMars Guitars represent design innovation, ergonomic aesthetics and technical brilliance, all inspired by the natural beauty of Vermont. A guitarist and bassist for over three decades, Dan DeMars has designed guitars for over twenty years and has worked with legendary instrument designer Ned Steinberger, who reminded him that there are no hard-and-fast rules in design and guitar making. For several years, Dan headed the marketing, advertising/promotion and artist relations functions for Ned’s concert string instrument company, NS Design. While working with Ned, Dan established Musica Viridis, a consulting firm that facilitated the marketing operations of small-to-midsize makers of musical instruments. In this capacity, he continues to consult with several guitar companies. Ned’s influence – and the business potential evident at NAMM – encouraged Dan to develop DeMars Guitars into a viable commercial enterprise. 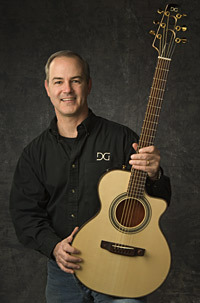 In addition to being a guitar designer and builder, Dan holds an MBA from a “Top 10” business school and brings a wealth of business management experience to the musical instrument industry. Dan and his family reside in Norwich Vermont.